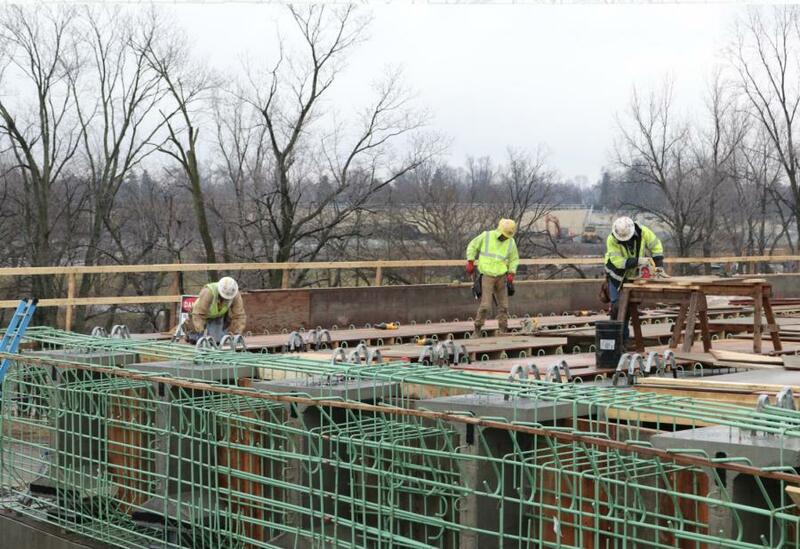 Extensive work on the Interstate 75 widening and reconstruction project in Findlay, Ohio, allowed the project to reach its first major milestones during 2018, and work continues as the project enters its third year of construction. In 2018, the most notable changes in traffic patterns occurred off the mainline lanes of Interstate 75. In October, Lima Avenue closed to through traffic and pedestrians under U.S. 68/State Route 15 for approximately one year. "The closure of Lima Avenue allows us to build the double roundabout on Lima Avenue, which is a crucial feature of the redesigned interchange at Interstate 75, U.S. 68/State Route 15 and Lima Avenue," said Kirk Slusher, ODOT District 1 deputy director. "It's an inconvenience now, but a safer and more practical interchange will come from it." Additionally, a new traffic pattern was put in place at the interchange of Interstate 75 and U.S. 68/State Route 15. A new flyover ramp was opened in November to carry traffic from Interstate 75 southbound to U.S. 68/State Route 15, replacing the old loop ramp configuration. "The ramp carries traffic up and over the mainline lanes of the interstate to get to U.S. 68/State Route 15, which allows for safer and faster travel between the two highways," Slusher said. Below are some facts that tell the progress of the project's second year. The reconstructed Harrison Street overpass opened in January. The original overpass was replaced with a taller and longer structure to accommodate the additional travel lanes on Interstate 75 below it. The second of three phases to reconstruct the Interstate 75 bridge over the Blanchard River was completed in the summer. The second phase of the bridge, located in the middle of the structure, currently carries both lanes of northbound traffic while the third phase of the bridge is constructed. Construction of noise walls along the project finished, except soil grading and seeding. The entrance and exit ramps on Interstate 75 northbound at State Route 12 and U.S. 224 were reconstructed and reopened. The new flyover ramp from Interstate 75 southbound to U.S. 68/State Route 15 opened in November, replacing a loop ramp configuration. The ramp from U.S. 68/State Route 15 to Interstate 75 southbound closed in November through late 2020 to allow for construction activities at the interchange of Interstate 75, U.S. 68/State Route 15 and Lima Avenue. Lima Avenue beneath U.S. 68/State Route 15 closed to through traffic and pedestrians in October for approximately one year to allow for the construction of a double roundabout and a new bridge structure in the area. A gas line near Logan Avenue was relocated to allow for the roadway's realignment with Lima Avenue. A third travel lane was opened on Interstate 75 northbound between U.S. 224 and county Road 99 in December. A third travel lane is expected to open on Interstate 75 southbound in the area later this month. Traffic in the area travels on intermediate pavement, with final pavement surfaces to be placed toward the project's completion in 2020. Significant work also was completed on the reconfigured interchange at Interstate 75, U.S. 68/State Route 15 and Lima Avenue. Multiple bridge structures are currently under construction at the interchange to carry various ramps and mainline lanes over one another and over the railroad tracks in the area. Work will continue in the area of the interchange through late 2020, when the entire project is slated to be completed. Slusher said significant work will occur over the winter when weather permits. Two lanes of traffic on Interstate 75 will continue to be maintained most of the time while construction continues. Some occasional nighttime closures will occur. Construction of the third phase of the Blanchard River bridge, which will carry all three Interstate 75 northbound lanes when finished. The first two phases of the structure, which have already been completed, will carry the southbound lanes in the final traffic pattern. Construction of the ramps and double roundabout at the interchange of Interstate 75, U.S. 68/State Route 15 and Lima Avenue. Drainage work near Lima Avenue. The $114 million project reconstructs and widens approximately 5 mi. of Interstate 75 from just south of the Harrison Street overpass to the County Road 99 interchange north of Findlay. The project also includes the replacement of all mainline bridges on Interstate 75, replacement of the Harrison Street overpass, the redesign and reconstruction of the interchange between U.S. 68/State Route 15 and Interstate 75, and the redesign and reconstruction of the interchange with U.S. 68/State Route 15 at Lima Avenue. The entire reconstruction project is expected to be completed in late 2020. Beaver Excavating, Canton, serves as the general contractor on the project.